Fig. 7.7A, B Ancient osteitis pubis with decreased tracer uptake. 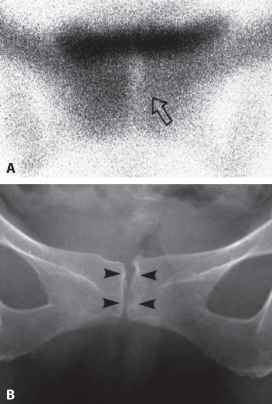 A Anterior pinhole scan of the pubis in a 42-year-old female with old painless osteitis in the left symphysis pubis shows decreased para-articular uptake with minimal joint space widening (open arrow). 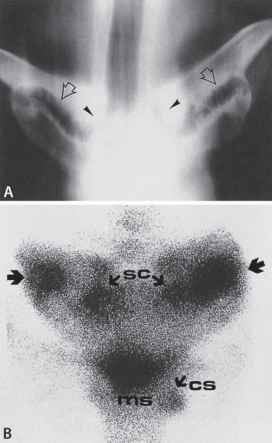 B AP radiograph reveals reminiscent irregular para-articular sclerosis with bone defect (arrowheads). 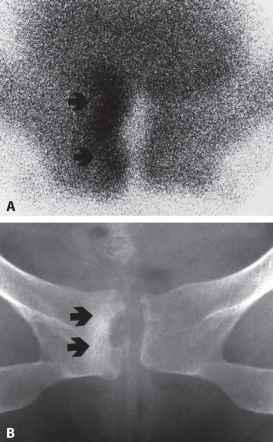 Decreased tracer uptake may reflect an atrophic state the same disease under the term osteitis con-densans claviculae. Radiographic changes include irregular os-teolysis and bony condensation in the lower aspect of the medial clavicular end with occasional spurring. Narrowing and subchondral cyst formation may be present in the adjacent sternoclavicular joint (Jurik et al. 1985). For the diagnosis of these changes, often not prominent, conventional X-ray tomography or CT is required (Fig. 7.8A). Scintigraphically, the condition is characterized by intense tracer uptake (Teates et al. 1978). Pinhole scintigraphy reveals two different tracer uptake patterns: moderate uptake in the lower part of the medial clavicular end and rather conspicuous uptake in the sternocla-vicular joint (Fig. 7.8B). 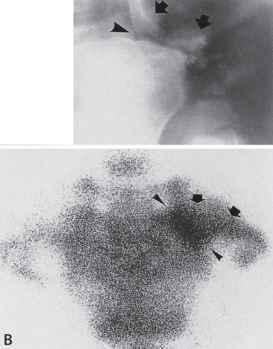 The findings basically differ from those of Friedrich's disease (osteo-chondrosis of the clavicle), in which uptake is sharply localized to the aseptic necrosis of the medial clavicular end (Fig. 13.5). Fig. 7.9A, B Sternocostoclavicular hyperostosis. A Anterior conventional X-ray tomogram of the sternum in a 42-year-old man reveals a sawtooth-like synostosis between the medial ends of both clavicles and the first ribs (open arrows) and bony fusion of the sternoclavicular joints and the first costosternal junctions (arrowheads). The manubriosternal junction is also involved (not shown here). B Anterior pinhole scintigraph shows intense tracer uptake in the sternoclavicular (sc), costosternal (cs), and manubriosternal (ms) joints and their periarticular bones. The most conspicuous uptake is seen in the costo-clavicular synostosis (arrows) and the fused manubri-osternal junction (ms). The whole picture may well be likened to a "pansy flower"